It emerged in August that funding from the European Investment Bank (EIB) had stalled since the Brexit vote. That raised fears that ambitions to build thousands of new properties for social landlords could be threatened. Principality has now agreed to support the sector with loans that will be paid back over 15 years. 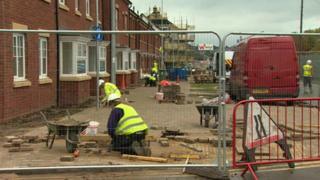 Housing associations are planning to build 13,000 affordable homes in Wales by 2021. Community Housing Cymru (CHC), which represents social landlords, had been trying to get loans worth £200m to fund the building. It had hoped that would come from the EIB but said it had stalled after the UK triggered Article 50 negotiations. The EIB said in August that its UK investments had declined but insisted it had signed a number of contracts since Article 50. Single parent Nicola Eynon has been renting her home in Cardiff from a housing association for around 20 years. She said as well as lower rent, it had also given her stability. Ms Eynon said had she been renting from a private landlord she would have been worried that the rent might go up or that they might sell the house. The security of renting from a housing association gave her the confidence to go to university, she said. "I've not had to worry about a roof over my head and my rent is set. About seven years ago I went to university to study housing policy. "I could afford to do it with the student loan and pay my rent. It's given me and my son a fantastic foundation to build on." CHC chief executive Stuart Ropke said: "Losing the EIB money quite late in the day was a worry, as the terms on offer were exceptional. "Principality coming into the market is definitely a help in getting us towards that target." For the housing associations the benefit of money from Principality is that the loans would be paid back over 15 years. That is hard to get from other lenders. Principality's commercial managing director Peter Hughes said the society's members wanted them to invest in social housing. "Housing is a long term investment and requires long term funding and we felt this was a chance to work collaboratively," he said. "We find it very consistent with our purposes too." The money from Principality does not plug the whole gap in finance as CHC had been trying to raise £200m. The challenge now is finding the rest if Wales is to achieve its social housing target.